There’s an okau story here, but the action scenes are too heavily loaded up with fake looking computer effects to the point where it takes you out of the movie. Indiana Jones And The Kingdom Of The Crystal Skull is the fourth Indiana Jones film, and like the movie live free or die hard from around the same time, it was released over a decade after the trilogy that started the franchise. 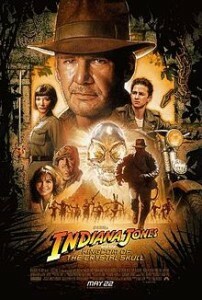 with that in mind, it was a sort of updated version complete with a teenage actor in a leading role right alongside our hero to be someone of interest for the young audiences who were unfamiliar with Indy, and to be a possible replacement for when harrison ford gets too old to make these movies anymore. in live free or die hard, that teenager was justin long. here, in the fourth indiana jones movie, it’s Shia Labeouf. the movie starts with indiana and his partner (Ray Winstone) being held captive by russian soldiers in new mexico. they talk about some of the adventures they’ve been on and next thing you know, indy is escaping and winstone is turning on him to show that he really works with the russians. it reminds me of ilsa, in indiana jones and the last crusade, pretending to be on indy’s side, but really being with the nazis. indy escapes again, but not before we learn that they are in area 51, in roswell, new mexico, and that there are alien bodies here that the russians are interested in. there’s a nuclear bomb being tested in the area that indy narrowly avoids being destroyed by, and also a sort of super speed jet car invention that indy gets in before blasting out into the distance. all of this reminds me a little of minority report and director spielberg’s interest in uncommon vehicles and machines. indy goes back to teaching at a university, something that we saw him do in the previous three films, and the real quest of the movie doesn’t begin until shia labeuf arrives. he shows up with news of one of indy’s friends who is in trouble somewhere in south america. it’s similar to how a man showed up in last crusade with news of how indy’s father was in trouble somewhere. and indy and shia go off on a mission to find both this man and shia’s mother. At this point, just like in last crusade, they start playing detective and following clues. they go to the professor’s jail cell and see marks that he drew on the walls and floor. they try to interpret them and it leads them to an old graveyard. Once here, they find a tomb that leads to an underground tunnel. it all feels a little like a national treasure movie. they find the crystal skull in the tunnel, but find that they have been followed by the russians and are now going to be made prisoners and brought back to the russian camp. here is where indy reconnects with the professor, ox (played by john hurt), and his ex-lover, shia’s mom, marian ravenwood, from the original indy film, raiders of the lost arc. From here on in, until the end, the movie basically turns into a non-stop action picture. the story has dominated so far, for about the first three quarters of the picture, but now in the final portion of the film, action takes over. that might have been okay, if the story was still there and relevant, and also if the action would have been even semi-realistic. instead we get four action moments in a row, one more ridiculous than the next. first, it’s shia fighting in a sword fight while standing on a car. he fights the head russian villain (cate blanchett), and the scene gets really out of hand when shia puts one foot on each of two cars that are moving at top speeds, side by side, and continues to sword fight. and it’s not as if this movie has in any way established that shia’s character even knows how to sword fight. After that, there’s shia swinging through the trees like tarzan, jumping from vine to vine, as he swings on them, with an army of monkeys swinging along with him. now I understand the other indy movies had some crazy ideas to them, like people’s faces melting off, or taking a heart out of someones chest and them still living, but this swinging through the trees with monkeys business is making it more silly than anything else. following that, their car goes off a cliff and lands in a tree which springs them back up to the cliff top they came from. and after that, they’re in a car traveling down three humongous waterfalls and there is no death or injury at all. piece of cake. apparently. the film had enough of the old ideas going for it to make it work. i did appreciate the mystery of a story and the thrill seeking adventure. i also enjoyed having two villains, just like in the third movie. here, it was blanchet’s female villain as the real enemy, and then winstone as the greediest of them all. as the movie went on, it started to rely too much on cg effects to get the ideas they wanted, which is something the other movies in the franchise never really did. overall the movie was fun, but it had some major problems toward the end.